I don't have that many recent purchases to be ashamed of, but there defiantly are a few so I thought what the heck, I should just continue to embarrass myself and tell everyone about them! So I went and picked one out and against my better judgement, I bought it knowing I'd have to lie to Kirk for a short time about the cost for his own sake. (okay for mine, I get the "talk" a lot.) Today he saw the Visa bill and was confused because the price I gave him was the american price without the shipping cost, so basically it had almost doubled when converted to canadian. Opps.. and the worst part is that I bought it to ware to Kirks work party tomorrow night and it hasn't arrived yet. So I had to go to the mall today and look for another dress and I found one on sale for 29.99$ marked down from 100. Apparently I love throwing money away. This is the dress I ordered from Shabby Apple. That reminds me of the time when I got cash back at the self-checkout while I was buying some things from Wal-mart, and forgot to take the money when I left. I just left it there!! I still feel sick about that. The next mistake was a result of my excitement for booking the cruise we're going on next month. Right away I was on E-bay looking for sandals to buy and I saw a cute pair of sketchers that were cheep so I bought them. But then I found pair of Ugg's that I had to have, again against my better judgement because they were not cheep. I thought for sure I was going to get outbid... but I didn't so now I have two pairs of sandals, and I'm not even sure you can get the Uggs wet and that wouldn't exactly be practical. Maybe if they weren't both brown I could get away with it, but they are so I told Kirk I bought us each a pair. There's no way I'm going to let him have my uggs though so I'm probably in for another chat that I'm not looking forward to. I honestly can't blame him for being upset sometimes though, can you? I'm not done buying things unfortunately, I still have to find another bathing suit and a beach bag for the trip and I'll probably think of even more things before then. I think I need someone who's "financially conscious" to give me some advise. Actually, just checking with Kirk before I buy things would probably work too. Oh Lindsay you crack me up! :) First of all, your purchases are ALL so cute. Secondly, I LOVE that you and Kirk can share shoes (sounds like me and Tim...) And lastly, I'm so excited for you/jealous that you're going on a cruise! Have fun, and think of me freezin my tail off in Fort Mac! Lindsay, your so great! I can't wait to see these dresses. 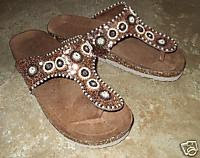 And the sandals are veery cute! At least you haven't escalated to having your own credit card he doesn't know about. There is still hope! When do you guys go again? ?